Running a successful e-commerce business is not easy. It requires a lot of time and effort to get ahead in highly competitive markets. Most businesses don’t have proper resources to compete with the top dogs in their market. Nevertheless, there are simple tactics you can use to keep people coming back to your site for more. Testing dynamic pricing for your products is one way to approach that. WooCommerce Dynamic Pricing & Discounts happens to be a handy plugin that lets you better manage pricing rules and cart discounts. 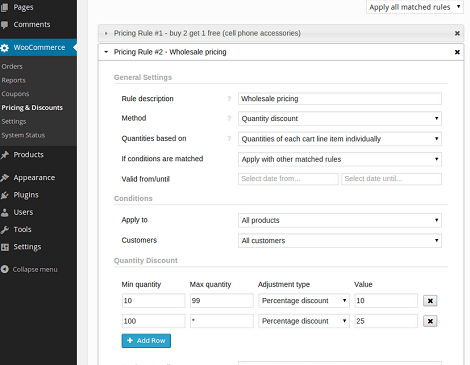 The plugin allows you to create your own pricing rules. You can control which ones are applied (e.g. all or first matched). Webmasters have the option to apply rules only to certain products and categories. You can offer discounts when people buy more items or spend more money. It is up to you how to put this plugin to good use. You can apply conditions to all products, certain categories, products in a list, all customers, certain roles, and more. Whether you want to create your own VIP club or encourage people to buy complementary products on your site, this plugin has you covered. The possibilities are endless. You need to run WooCommerce to take advantage of this script.